From the series Leicestershire, 2012 by Mitra Tabrizian. Mitra Tabrizian is an Iranian born photographer based in London. Her work has been exhibited and published widely in international museums and galleries including the V&A and a recent solo exhibition at Tate Britain in 2008. She is also a Professor of Photography at University of Westminster where I was fortunate enough to have her as a tutor. Mitra’s photographs cover big topics. Corporate culture, displacement, and loneliness are a few of the themes that are raised in her work. He most recent series Leicestershire looks at unemployment and the impact of financial collapse, like factories being shut down, while Lost Time is focused on individual stories of people caught up in the economic struggle. Considering Mitra’s ability to discuss and engage with complex issues and theoretical frameworks (as seen in her writing) her practical work is not one to suffer from ‘over-thinking’. Quite the opposite. Somehow the ideas embed themselves in an eloquent and visually elegant manner, making the work often more accessible than the theory behind it. This, for me, is photography at it’s best. Not shirking the theory off as esoteric and pretentious, as some might and do, but understanding it and putting it to good use. She manages to do this whilst retaining that photographer’s instinct; creating a space to transform the ideas into a visual language, and in doing so, communicating to our senses in a powerful way. 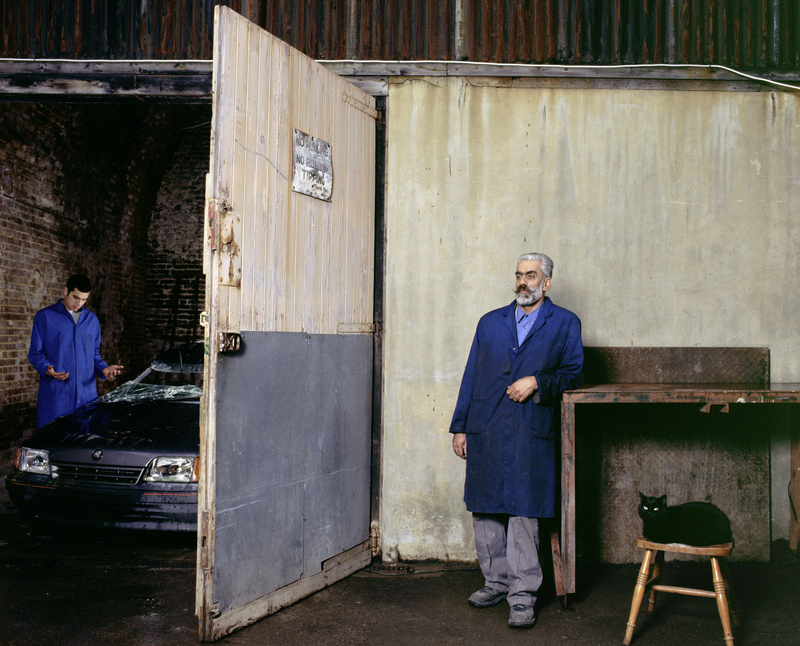 You may be able to catch the end of her exhibition Another Country at The Wapping Project Bankside if you hurry. Failing that, she published the book Another Country this year which assembles her most recent works, available here and published by Hatje Cantz. Sharon Boothroyd: Your work incorporates elements of fictional narrative (to a greater or lesser degree) to portray hugely real and universal themes such as the lure of capitalism, estrangement, exile and displacement. What is gained by using fiction to discuss these big themes? Mitra Tabrizian: This is a big and complex question, a short answer would be, at one level, (some of) my work could be read as an ongoing commentary on corporate culture and where it is taking us. I don’t think you could really ‘discuss’ these big themes within an art /photographic context. So the work is more of an allusion to aspects of what we might call the ‘crisis of contemporary culture’, from a critical perspective. What enhancement does using real people enacting their stories (like in Lost Time) bring to the work as opposed to hiring professional actors? In the past, I sometimes used actors or non actors/ friends to stand in for the subject in a particular scenario, as the main ethos then (following yet again Brecht’s ideas) was, you don’t necessarily have to use the real workers, for instance, to say something about working condition in a factory. I now think its important for the actual people to participate; to ‘play’ themselves in the image which, in one way or another, reflects their lives. As something else happens in that process of reconstruction! For instance, I produced the series ‘Lost Time’ in 2002 when the companies ‘restructuring’ plan forced many to take an early retirement. Focusing on business men and women in their 40’s & 50’s, the project addressed the concept of ageism by portraying the individual’s sense of (premature) inactivity, unwantedness and ultimately ‘failure’ in a society where, more than ever, the young are fetishised. 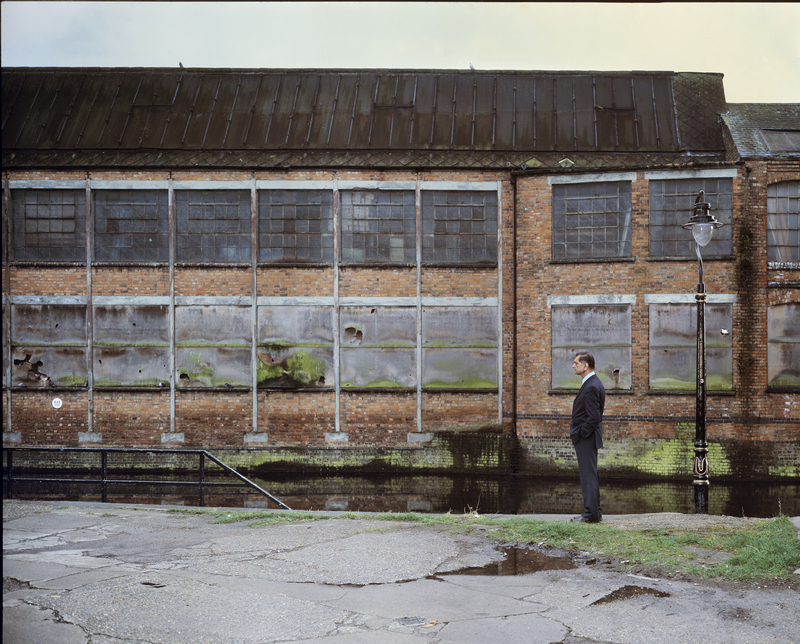 From the series Lost Time by Mitra Tabrizian. Amongst the participants was a BBC producer in his 50s who was asked to reapply for his job, which was producing a program that he had created himself! He was gutted and resigned. 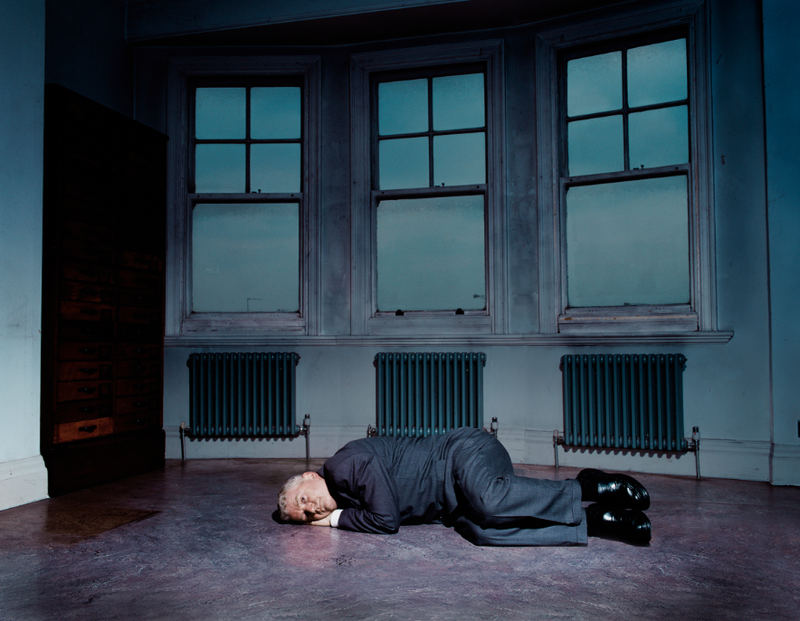 After hearing the story, I had this image of a man in a suit, curled up on the floor. But I felt very uncomfortable asking him to do this, when eventually it came up in the conversation, he really liked the idea. ‘You hit the nail on the head!’ he said. For me, this is the most powerful image in the series, mainly because its a more ‘genuine’ , if you like, portrayal of pain and disappointment at the most private moment, of someone who has gone through a particular experience. As a practitioner of both the moving image and still photography can you briefly mention what you consider to be the benefits of each medium and how they complement each other? I see photography and film as two separate entities. And I’m referring to narrative films here and Not video arts. Especially when it comes to making a film as you need to employ a different strategy of working altogether. I have made three short films. All are narrative based and you realize how difficult it is to tell a story successfully. And that’s a big challenge, as you have to be able to see the bigger picture from the outset, at least for me (as different directors work differently), whereas in photography you can afford to experiment more (i.e. you don’t necessarily have to plan it all in advance). What hopes and fears do you have for the future of photography? I see the critical task of art today as that of offering an alternative to the media. I am opposed to any form of conformity to the contents and codes of the doxa … even when these are deployed with a ‘Left’ agenda, as I believe that in this particular case ‘one cannot dismantle the master’s house with the master’s tools’. So Burgin warns us against what he calls the ‘progressive colonization of the terrain of languages, beliefs and values by mainstream media contents and forms -imposing an industrial uniformity upon what may be imagined and said’ and the art world is no exception to this process. So ‘conformity’ is something we may fear, as for the ‘hope’, I have no idea! What piece of advice would you pass on to younger artists? Deadly Affair, from the series Border by Mitra Tabrizian.